THE GRADE 6 experience is vast in the sense that kids can be anywhere on the innocence spectrum. Some are still playing with toys and seeing the world through rose-coloured glasses while others are coming up against the first hit of puberty and diving headfirst into the messiness of adolescence. This range of difference accounts for the variety of subject matter and tone in books featuring characters in upperelementary or junior-high school. 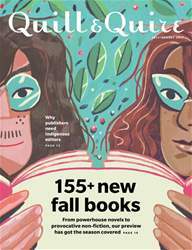 155 + New Fall Books: From powerhouse novels to provocative non-fiction, our preview has got the season covered; Why publishers need Indigenous editors.